Very lovely!!! Very fond of the immediacy/real life feeling left in your editing and shooting. These photos are great Roz, i especially love all of the ones by the trees. The lighting looks great. I can't believe there's still snow on the ground, you must live quite high up. I've just posted some photos i took today out and about in London, let me know what you think. The second look is lovely! This is most definitely my favorite shoot of yours. The outfits are absolutely stunning! Beautiful photos, styling, model - it all came together to suit your fashion story. I love the first photo, you've really captured the theme! The cat story is so cute, I've met a few cats like that, one time I was followed for like 5 blocks by a little black kitty that was so overly friendly and I worried that it was going to get lost. What beautiful pictures!!! I love the outfits and the composition - just beautiful! I adore the first mirrored picture! Um hi, you are gorgeous. Kthxbai. Beautiful shoot. I love the first picture! What a beautiful shoot, I think all the outfits work wonderfully. 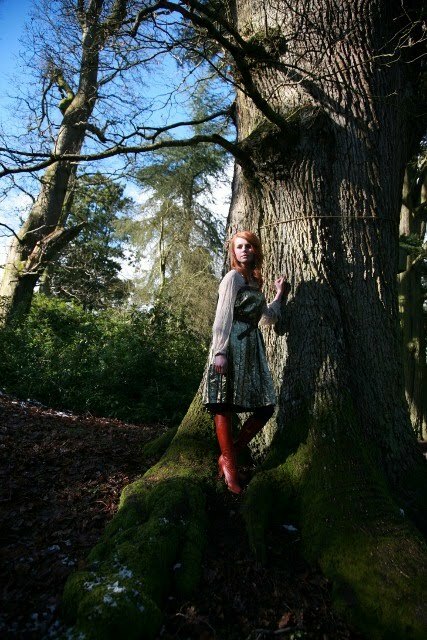 I particularily like the photo from the first look with Emma standing in front of the stone pillar. P.S I posted an award for you on my blog. Unbelievable!! you are a great photographer!. 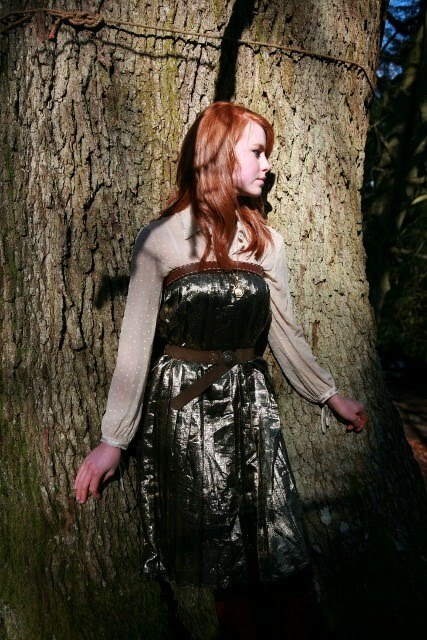 Emma is perfect, her hair is so beautiful.... the garden is full of green and spring, and the light is unbeatable! sooo beautiful. the pictures on your blog are always so gorgeous! gorgeous photographs! I love your bright red hair! toooo cute! These photos really look professional. The lighting is beautiful, and of course, Emma is, too. It's wonderful how you put so much thought into these shoots, drawing inspiration from many sources. You are going places, Roz! Super Beautiful, great shots! the colors look amazing, wow! 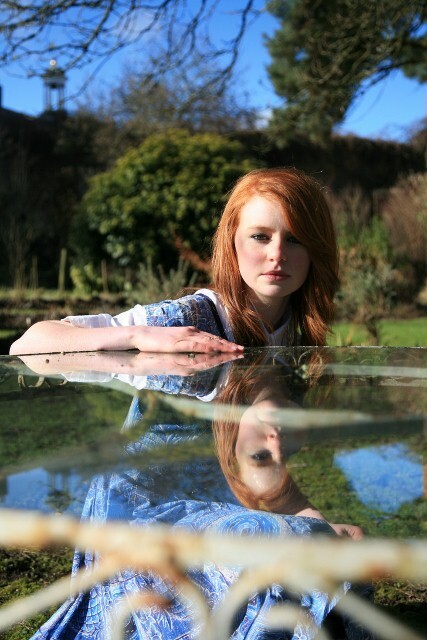 I loved how this was inspired by Alice in Wonderland (Emma you look beautiful!) I'm actually going to go see the movie in a couple of hours!! By the way I left you a lovely blog award on my blog, so GO CHECK IT OUT and keep up on the great posts!! I looove these shots, especially the first one, it's divine! and those pictures are gorgeous! they are all great shots, but my favorite is the one where she is standing on the tree roots. the boots you chose for that picture stand out perfectly. I think if you post some of it up sometime, I did not see ... and I feel terrible about it. Can she be more tender??? You have a talent that just makes me think of your father, something like the drawing talent I have inherited from my father, although I always thought that the talents we make ourselves. Well, back to the subject of Emma (if you saw it in Spanish, I mean the "theme of Emma" you'd have a comical, it is like a rhyme. If you can pronounce it ... "THE TOPIC OF EMMA") Again becoming the issue of EMMA! I love all the outfits you chose for the session and the curious cat seems friendly. Besides the setting, which is natural is always so wonderful. I wish I lived in a rural place ... so that you understand I live in a suburb in the middle of town, bored. Although I have my advantages, like having the store nearest you and well ... the movie theater is an advantage??? Anyway ... back to the subject of Emma! She is just lovely. It's your friend??? it turns out that you do not represent the age you are but she will have maybe 15 years? Congratulations on your wonderful work with the camera, either in front or behind this, you're a genius. A big kiss to you and Emm. love the hair and the second look! Loving the outfits in this- you can see the influence but I like the individual twist!